1. Does TINO IQ finds buy / sell recommendations for “all stocks” everyday ? TINO IQ’s algorithms scan all stocks every day. If an algorithm finds a pattern, then TINO IQ’s quality module, verifies the effectiveness of this pattern as suggested by the algorithm. 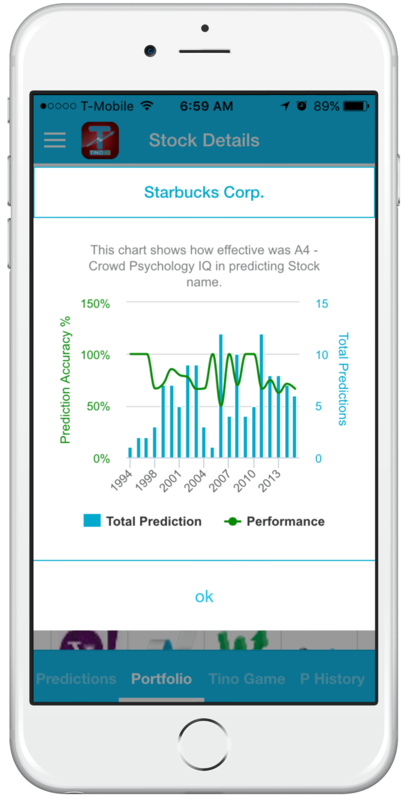 Once the effectiveness of pattern is validated, the stock is made available on the TINO IQ app. Generally less than 1% of all stocks pass through this rigorous test on a daily basis. 2. Do you analyze penny stocks ? TINO IQ’s database currently has only Blue Chip stocks with a good trading volume. This enables our clients to trade-into/out of the trades easily. We can add some penny stocks with good volume. 3. How do I know what TINO IQ is saying is correct ? Very few stocks pass through our strict quality checks, and we are not like many companies who claim success if 1 out of 100 predictions work. For us every prediction should work. We openly provide all metrics to the user, where they can see what happened in last 20 years when Algorithm X gave a buy/sell signal for Symbol Y. 4. Why don’t you trade it yourself ? Yes, we can and we do – However it’s not possible for us to trade in all the market’s / stocks every day. Essentially we have the same level of access as Gold plan members. 5. How are you better that other companies ? We don’t predict too many stocks, and our proprietary algorithms capture trading pattern from multiple angles. This enables us to find small and actionable trading opportunities. We have spent many years building algorithms which track patterns where people are trying to artificial manipulate a stock. All these algorithms help our clients to make a rational decision when pressing that buy/short button. We would have to fill up a page telling about more features. Please take a look around our site and see for yourself. 6. I like the BUY recommendation, however next day stock already gapped up ? Market’s move every day, so getting a good entry/exit point is vital. If the stock has gapped up then you should wait till the price of the stock is at or below the suggested price. If you don’t get this price in 1 or 2 days, it’s better to skip this trade and look for other stocks. 7. Can you explain algorithms, how they work ? Kindly refer to http://tinoiq.com/why_tino_iq for details on algorithms. 8. Which stocks do you Analyze ? We currently analyze all stocks of Dow 30, S&P 500 and Nasdaq 100 Index. Additionally we have some ETFs from Vanguard, Proshares and IShares. We will be adding more stocks/ETFs regularly to TINO IQ. 9. Can a stock be in both Buy and Sell list ? Yes. This means that stock is expected to be volatile in next few weeks and would trade both up/down. In our research, we have found placing limit orders helps to get a stock at the best price. 10. What do you mean by 1 week expected return ? Let’s say the prediction is for a stock to gain 2% on 10/1/2015 when the stock is currently trading at $100. This means the stock is expected to touch $102 within the next 5 days. We strongly recommend you immediately take profits when it reaches $102, as stocks can come back to $100 or go even down. Similarly a stock can go up to $105 or $110. We believe in taking consistent, predictable profits as compared to hitting the jackpot one day and losing it the other day. 11. How do I understand probability number ? You toss a coin and want a head to come. The probability of that happening is 1 in 2 outcomes. Hence probability is 50%. For predicting TINO IQ’s result we calculate all the possible outcomes and present this number to you as probability. 12. Can I do option trading based on TINO IQ’s recommendations ? 13. I bought AAPL yesterday and sold it yesterday at predicted price ? There are still 4 more days to go, Can I repeat the trade ? No. The algorithms look at patterns each day and then compute the probability of a stock going to the expected price within the next 5 days. Once the target price has been reached the algorithm has already done it’s work. If you are trying to repeat the trade, you are trying your luck. 14. Which is your best algorithm ? 15. The prediction accuracy chart shows 70% accuracy for past few years, however stock is having 99% accuracy today ? 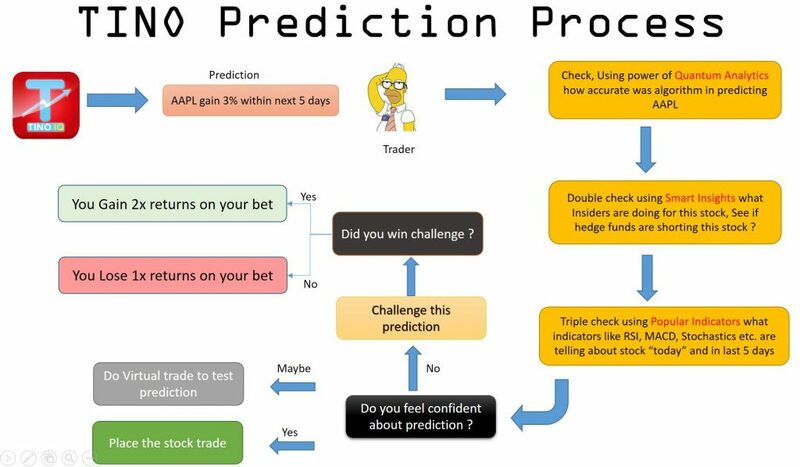 We treat our predictions very strictly, even if the stock misses it’s prediction by 1 cent during prediction period, we consider it a failure. We think, it’s better to be conservative rather and save money – hence we follow this strict approach. The probability number today is not an average of the past predictions. It is a number generated by algorithm today based on today’s market conditions. The Quantum Analytics chart is very useful in understanding how the algorithm has been successful in predicting the stock in past. Think about it — how many companies show you predictions they have made in the past and what happened to those predictions? Remember, Dot-com boom, housing bust etc. Companies just give reason to say why their predictions were not right. By the time they give predictions, it’s too late – people have already lost money. This is why we are being honest and transparent about every single prediction we make. 16. What’s the practical use of Hedging options screen ? While analyzing a stock you might come across, “I want more of these kind of stocks”. This is where correlation comes into picture. With the correlation screen you can find stocks which have similar trading patterns. 17. I see correlation for 12 months, however not for 6 months, how is that possible ?Let’s take an example: Stocks X and Y had a 98% correlation from Jan-Jun, however, had only a 84% correlation from July-Aug. TINO currently shows correlation of over 90%, hence you would not see the correlation for 6 months. 18. You started algorithms in 2006 and building app in 2015 ? Yes. In the initial years, we did not got any good results. Actually after working on it for nearly 7 years, we thought of giving up. However in early 2015 we started getting some good output and then started of building an app. We are fully dedicated to building better algorithms and will continue to build new and improved existing algorithms. 19. When can i see the prediction for next day ?Around 9:00-10:00 pm PST you we post the predictions for next day. If there are any data issues, then we try to get the prediction engines working before 6:30 am PST. You do not have to open and close or login/logout to see the new predictions. The predictions will appear automatically! 20. Do I have to invest large amount to make gain ? Trading of anything is a risk – Think about trading as a game where money is just exchanged from one hand to another – So for you to win someone is losing. At TINO IQ our philosophy is to have repeated, good small trades rather than one large trade. Putting a lot of money on one trade is risky, hence please look and understand the quantum analysis chart “before” making any trade. As you become more comfortable using TINO IQ algorithms, you will understand which algorithm to choose and where to put the bet. Please see http://trustedfinancialadvisor.org/live_portfolio.html to see how we are ahead of literally every hedge fund out there. 21. Do you have stop loss ? Yes and No. We have it for few algorithms and are working towards making it available for other algorithms. 23. How does TINO coin work ? 24. Do you have all the data for stocks in app ? We aim to put only “actionable” information in the app. General information does not have a place in the app. For any “general” information we provide links to various websites where people can see that information. 25. How do we interpret Artificial Manipulation message ? This indicates that algorithms have detected irrational price movements in the stock. These are generally associated with pump and dump patterns normally observed in the market. A stock with this message can continue to “irrationally” move up or down. This is why please refer to price targets to take small profits along the way and adhere to the stop loss targets. 26. What is this 88 or 77 or 66% in probability – Is it a bug ? We are doing this for a simple experiment. Generally we have found people would “sort” by highest probability and invest in that prediction. This is good, however –you should consider few more aspects before investing in any prediction, top one being “Quantum Analysis”. So when you see 88%, think of it as a high probability prediction and then use other tools in the app to decide if you really want to go for this trade or not. 27. How can I use tino coins to upgrade my plan ? 28. Does TINO IQ provide any tools for daytrading ? Even though our predictions timerange is for 5 to 10 days, historically many of predictions have been successful in a day itself. Additionally, in the app, you can see what popular indicators (RSI, MFI, stochastics etc) are telling about the stock and how good these indicators have been in predicting stock movements correctly. 29. I don’t see any predictions today ? You may be having the basic(free) plan which shows only low probability predictions. I am a trusted doctor - Are you ? Are you best doctor ?